1. 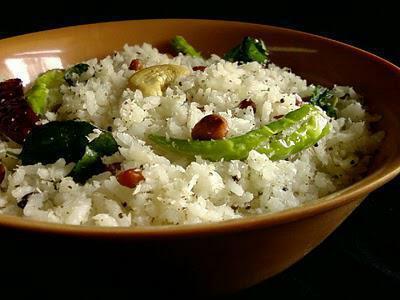 Cook rice with enough water and Salt and keep aside. 2. Heat ghee or oil in a pan. 3. Add Mustard seeds, Urad dal and Cumin seeds to it. 4. After the seeds starts spluttering add Chana dal, Peanuts, Cashew nuts and fry them for a minute. 5. Add Red Chilies, Green Chilies, Curry leaves and Hing, let them splutter fry till the dals turns into golden brown. 6. Add grated Coconut, Salt and fry for 3 to 4 more minutes or till the Coconut turns light-brown. 7. Add the Cooked rice and mix well. 8. Remove from heat and garnish with chopped coriander leaves.